Dive into Hebrews 10 with an entertaining, fast-paced discussion of an apostolic midrash on Psalm 40 and it’s appearance in the argument regarding the suffering of the Messiah as an atoning sacrifice for sin. Lancaster touched on this in one of his previous sermons, but in today’s lecture on the Book of Hebrews, he goes into depth about why we can’t compare the Temple sacrifices to the death of Messiah, and also why the death and resurrection absolutely doesn’t cancel the Temple service…because it would be like saying apples cancel oranges (my metaphor, not Lancaster’s). Lancaster, as he starts talking at the beginning of this recording, admits that his opinion of Hebrews chapters seven through ten, disagrees with all New Testament commentators everywhere. On the one hand, he says this probably makes him an unreliable source (and I know folks who would agree) since no other scholar corroborates his opinions. On the other hand, the traditional interpretations of Hebrews (and the rest of the Christian Bible) are fundamentally based on the theological necessity to remove the Torah and the Sinai Covenant post-crucifixion and replace it with New Testament (Gentile) grace. I’ve mentioned how more than once, Lancaster has pointed out how the theology of the Bible translators has been read back into the Bible such that they render the Greek incorrectly. The old system under the law of Moses was only a shadow, a dim preview of the good things to come, not the good things themselves. This is how the New Living Translation (or the “New Living Targum” as Lancaster quips) renders the first sentence of this verse. The word “only,” which I put in bold, doesn’t appear in the Greek, and the word “dim” is not indicated in the original text. The NASB, which is the translation I most commonly use, isn’t much better. At least the words I’ve bolded above appear in italics in the online translation of this verse, but a casual reader might not realize something is amiss. Lancaster then reads from Young’s Literal Translation which, while sounding awkward, renders the Greek text without attempting to interpret it. “Coming near” is a technical term, but I’ll get to that in a minute. The Torah is good because it contains a shadow of the coming good things. No indication that those good things have already arrived (because they haven’t) or that anything has been done away with. 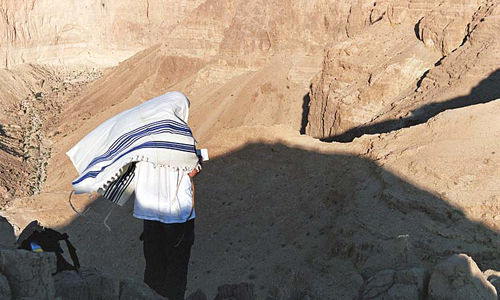 Just a statement that the ceremonies of the Torah foreshadow the Messianic Age and beyond. Lancaster explained his main point and I believe I got it, but it was hell trying to take notes so that point would be easy for me to explain. I’ll try to create a more straightforward statement than what I heard in the sermon, and then I’ll go back and cite some of Lancaster’s proofs. The sacrifices for sin listed in the Torah were never, ever meant to actually forgive intentional sin. In fact, there is no sacrifice for intentional sin in the Torah, only for unintentional sin. So what happened when a Hebrew in the days of the Tabernacle or the Temples intentionally sinned? Or, for instance, what happened if a Jew lived in the diaspora, the lands other than Israel, far away from the Temple, and he sinned? Did he have to go all the way to Jerusalem to give a sacrifice? But I guess that wouldn’t matter. Even if the Jewish person lived in Jerusalem and committed an intentional sin, was that person destined to burn in Hell for eternity because there was no sacrifice for intentional sin? This is David’s prayer to God after his sin with Bathsheva. He deliberately, purposefully, has an illicit affair with a married woman, impregnated her, tried to trick her husband to sleep with her by getting him drunk, and when that didn’t work, had her husband Uriah murdered, then quickly married Bathsheva so he could claim the child as his as a premature birth. However, none of that was hidden from God and David’s sins were “outted” through the prophet Nathan. Lancaster says that prayer and teshuvah (repentance) have always been effective for the atonement of deliberate sins. But then, why did God command the sacrifices at all if they weren’t effective for the forgiveness of sins? Was it that they “covered” the sins whilst the death of Jesus finally, completely washed them away? Lancaster said that’s not it. The sacrifices were never designed to atone for sins. OK, wait a minute. What about Yom Kippur when the Aaronic High Priest would enter into the Holy of Holies once a year to make atonement for the sins of all Israel? But in those sacrifices there is a reminder of sins year by year. For it is impossible for the blood of bulls and goats to take away sins. If the Yom Kippur (“year by year”) sacrifice never took away sin and neither did the required sin offerings for even unintentional sin, what did they do? What was their purpose? 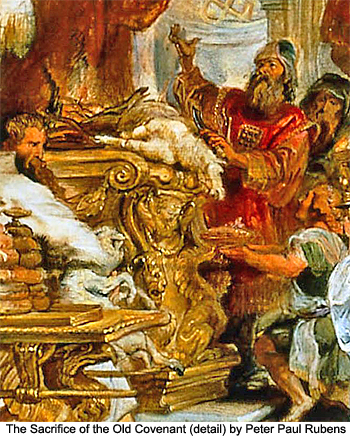 Remember, a Jew (anyone, actually) who sins intentionally or otherwise, can receive atonement for those sins through prayer and sincere repentance, so technically, there’s no real reason for making animal sacrifices, even when the Temple was standing, for the forgiveness of sins if you weren’t going to enter the Temple. But God commanded Temple services for all Israelites for a number of specific occasions such as Pesach, Shavuot, and Sukkot. 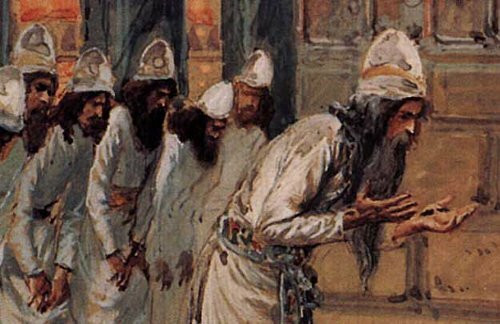 Jews had to enter the Temple for those moadim and to commemorate a number of other events and acts as well, including offerings when an unintentional sin was discovered. But if a person sinned, even if spiritually he was forgiven, according to Lancaster, he still needed to enter the mikvah and perform the required sacrifices for the purity of the body, so that the person could draw physically near to God’s Divine Presence. Even a woman who had recently given birth had to offer a sacrifice for sin, and even then, not until forty days after giving birth as commanded in the Torah. It wasn’t that giving birth was a sin. Far from it. But it’s a requirement for physical purification in order to draw near (the word translated “sacrifice” in English is “Korban” in Hebrew, meaning “to draw near”) to God’s Divine Presence. For imagine praying to God when His physical manifestation was only a few meters away. What an incredible experience to actually be commanded to enter into God’s Holy Presence at the Temple. I have to admit, this one is hard for me to wrap my brain around, since so much of the Torah language does speak of atoning for sins and forgiveness. Even Lancaster says as much. And yet, if sin, even unintentional sin, defiles a person’s body, he or she cannot enter the Holiness of the Temple and draw near the presence of God without purification of the body which was defiled because of that sin. Even if the person was forgiven on a spiritual level through repentance, and remember, some events, such as giving birth, required a sin offering even when there was no sin, there still remained the need for physical cleansing. That’s an especially important point because it means that Jesus (Yeshua) in his earthly existence, could still have been required to provide a sin offering at the Temple, even though he never sinned. He would just had to be in some state of ritual uncleanness (which is not a sin). That also means, certain prophesies about “the Prince” (Ezekiel 45:22) offering a sin sacrifice in the Messianic Age could indeed be about the sinless King Messiah. No supernatural hocus pocus required and no contradiction involved in a sinless person offering a sin sacrifice. This also has the benefit of helping us realize that the death of Jesus on the cross didn’t have to cancel the sacrificial system, the Levitical priesthood, the Temple, and the Torah, since it didn’t replace the actual function of that system. Animal sacrifices didn’t take away sin and then have to be replaced by Jesus who did. Prayer to God and authentic repentance has always provided for atonement. As far as Yom Kippur is concerned, the Aaronic Priest offered the required blood sacrifices and then he prayed for the forgiveness of his own sins and those of all of Israel. So what is so much better about the sacrifice of Jesus? It inaugurates by the merit of his holiness and suffering, the New Covenant era which does provide for the permanent perfection of human beings to make them sinless. The writer of Hebrews, although apparently quoting Jesus, is actually putting the words of Psalm 40 in his mouth, so to speak, since it is a prophetic Psalm. Psalm 40 was one of the songs sung by the priests in the Temple, probably during a Thanksgiving Offering. David is giving thanks for being delivered from some difficulty. Notice in verse six, he says that God “opened his ears” (in Hebrew, it literally says “dug out my ears”) meaning, according to Lancaster, that God enabled him to hear God in order for him to do God’s will. But Hebrews 10:5 renders the quote of that verse as “a body you prepared for me.” What happened? The writer of the Epistle to the Hebrews is likely a Greek-speaking Jew writing to Greek-speaking Jews and is using the Septuagint, the Greek Translation of the Tanakh, as a Biblical reference. Lancaster says a scribal error actually mistranslated the verse about “God opening ears” to “preparing a body” (you’ll have to listen to the recording to get the detailed explanation). However, the Hebrews letter writer makes good use of this error. If you’ve read all of Psalm 40, you’ll have noticed that verse six also mentions God not wanting sacrifices. Again, this isn’t replacing sacrifices, since a few verses later, David says that he delights in doing God’s will and God’s Torah is in his heart. He is again saying that the sacrifices aren’t designed to forgive sins, though they certainly are a part of a Jew’s obedience to God. By the way, the part of the verse in both Psalm 40 and Hebrews 10 that says “he was written about in the scroll of the book” is usually interpreted to mean Messiah, but Lancaster says it’s more likely that David meant the Torah speaks of anyone who does the will of God. However, as far as the body being prepared, Lancaster does say that this is the sacrifice that actually does provide for the permanent atonement for Israel’s sins and perfects them such that they will sin no more in Messianic Days. It brings forth the question of whether or not anyone will have to offer a sin sacrifice in the Days of Messiah, but remember, there are other reasons for making those sacrifices that have nothing to do with actually sinning. 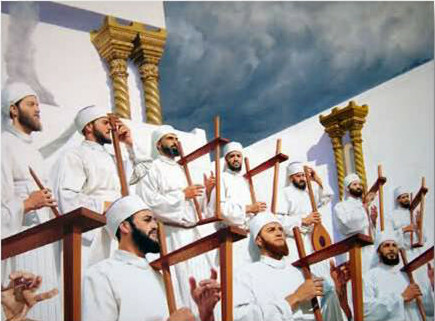 After saying above, “Sacrifices and offerings and whole burnt offerings and sacrifices for sin You have not desired, nor have You taken pleasure in them” (which are offered according to the Law), then He said, “Behold, I have come to do Your will.” He takes away the first in order to establish the second. By this will we have been sanctified through the offering of the body of Jesus Christ once for all. The first is that in order to draw near to God in the earthly Temple, the first system, the sacrificial system, was necessary, but this won’t work to draw near to God in the life of the world to come. The “second” speaks of a time past the Messianic Era when there will be no Temple. In Messianic Days, there will still be a Temple because while the redeemed will be perfected, not everyone alive then will be among the redeemed. However, in the world to come, when all evil has been extinguished and God once again lives among His people, the Temple will no longer be needed, just as at the first, when Adam and Havah (Eve) dwelt sinless in the Garden. From Lancaster’s perspective, it’s high time that the Holy Epistle to the Hebrews receive a fresh translation into English to do away with centuries of mistaken translations and interpretations based on the errors required by Christian tradition. Messiah came to do the will of his Father and by that will, we have been sanctified due to the offering of his body and the merit of his holiness. I have only touched on some of the points Lancaster made. In the approximately forty minute lecture, he inserted a lot more detail. I hope I’ve been able to adequately summarize his sermon and make it understandable. For this one especially, I recommend listening to it yourself. Lancaster says, and I agree, that his interpretation is highly unorthodox, but it has the benefit of not throwing the baby out with the bath water, or in this case, extinguishing the Temple, the priesthood, the sacrifices, and the Torah in order to establish and lift up the Messiah as the mediator of the New Covenant, for in fact, the earlier must flow seamlessly into the latter for the Bible to make any cohesive sense at all. Previous PostCan You Help Us Find a Bible Study for the Coming Year?Next PostDoes God Forgive Jewish Sins on Yom Kippur? Aaron and Daniel and a few of the guys from BI were having a discussion about the idea of ‘taking up’ or ‘lifting up.’ Turns out there is a notion discussed in Judaism somewhere (PL, can you help here? ): What to do when two mitzvot present themselves to you at once. Which one do you do? The solution: do the first and pick up the other to do next. Interesting tie in? It would also be interesting to find the Hebrew equivalent for the Greek word translated ‘establish’ in the last bit there. Is it the same Greek word we translate as ‘fulfill’ in Matthew 5:17? Hi Steve. Yes, both of those ideas are over my head, not being a Talmud scholar nor a linguist. I agree, the answers to your queries could be illuminating. I understand what you say about ritual uncleanness not being equated with being in sin. thanks for clarifying. in Christian teaching I have heard and read the two are equated. there is a negative connotation given to someone being ritually unclean … an attitude such as the Jews treated those unclean with contempt or derision. now I see being unclean had nothing to do with sin .. it was just a matter of the matter of ones physical state when approachingGod. In the days of the Temple, just about everyone existed in a state of ritual impurity at one time or another. A woman was impure because of her monthly period or childbirth and had to undergo a series of rituals to cleanse herself before even approaching the Temple to offer korban. A man could be unclean because of an involuntary night time “emission” or even having normal marital relations and had to undergo ritual cleansing before offering korban at the Temple. It had nothing to do with sin and everything to do with cleansing of their physical state before drawing near to the physical Divine Presence in the Temple in obedience to the commands in the Torah of Moses. You’re right about how this has generally been misunderstood by most Christians, but when we misunderstand this, we get things wrong about what Jesus and his disciples taught, and doing that, we get the wrong idea about Jewish people and God’s intentions for them.